See recent and estimated tuition and fees for Berry, and how these costs compare to regional and nationwide averages. Learn how the tuition and fees at Berry College compare to other universities and colleges and learn what you can do to effectively get prepared for possible college tuition increases. The next table outlines how Berry measures up to other schools nationally, regionally and by state. How Much Will Tuition & Fees Be for Berry? In the 2017 - 2018 academic year, regular undergrads at Berry were billed $35,176, before corrections for financial need. Of that number, the cost of tuition came to $34,950. $226 was fees. In contrast to public colleges, Berry does not offer a tuition discount to residents of the state. Fees and tuition costs quoted on this page do not include room and board, which will increase your costs. Having said that, many students will end up spending below full tuition after collecting financial aid as well as other reductions. View Berry cost per credit hour here. There has been an increase of 4.9% in Berry College tuition and fees for out-of-state students in the past 5 years. Tuition grew by 4.9% and fees grew by 0.0%. This year, undergrads should anticipate paying $36,893 based on current projections. Due to price increases, the full cost of a four-year degree from Berry will be $158,728, and the full price of a two-year degree would be $75,586, which doesn't include additional charges for books, transportation, and room and board. 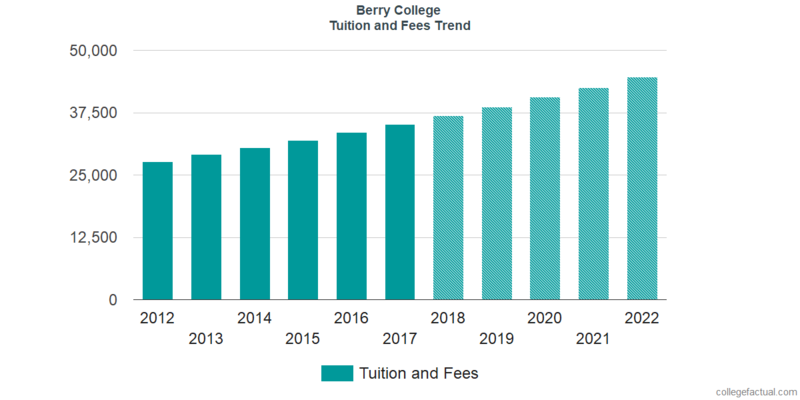 The subsequent chart reveals projected upcoming tuition and fees for undergraduates at Berry. At most schools you will end up paying out more for your last year of college than you will in your first. This is because of yearly price increases. It's smart to keep yourself updated!